For other uses, see Eardrum (disambiguation). In the anatomy of humans and various other tetrapods, the eardrum, also called the tympanic membrane or myringa, is a thin, cone-shaped membrane that separates the external ear from the middle ear. 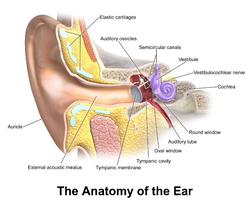 Its function is to transmit sound from the air to the ossicles inside the middle ear, and then to the oval window in the fluid-filled cochlea. Hence, it ultimately converts and amplifies vibration in air to vibration in fluid. The malleus bone bridges the gap between the eardrum and the other ossicles. Right eardrum as seen through a speculum. Rupture or perforation of the eardrum can lead to conductive hearing loss. Collapse or retraction of the eardrum can cause conductive hearing loss or cholesteatoma. The tympanic membrane is oriented obliquely in the anteroposterior, mediolateral, and superoinferior planes. Consequently, its superoposterior end lies lateral to its anteroinferior end. Anatomically, it relates superiorly to the middle cranial fossa, posteriorly to the ossicles and facial nerve, inferiorly to the parotid gland, and anteriorly to the temporomandibular joint. The eardrum is divided into two general regions: the pars flaccida and the pars tensa. The relatively fragile pars flaccida lies above the lateral process of the malleus between the notch of Rivinus and the anterior and posterior malleal folds. Consisting of two layers and appearing slightly pinkish in hue, it is associated with[vague] Eustachian tube dysfunction and cholesteatomas. The larger pars tensa consists of three layers: skin, fibrous tissue, and mucosa. Its thick periphery forms a fibrocartilaginous ring called the anulus tympanicus, while the central umbo tents inward at the level of the tip of malleus. The middle fibrous layer, containing radial, circular, and parabolic fibers, encloses the handle of malleus. Though comparatively robust, the pars tensa is the region more commonly associated with[vague] perforations. The manubrium (Latin: handle) of the malleus is firmly attached to the medial surface of the membrane as far as its center, drawing it toward the tympanic cavity. The lateral surface of the membrane is thus concave. The most depressed aspect of this concavity is termed the umbo (Latin: shield boss). Sensory innervation of the external surface of the tympanic membrane is supplied mainly by the auriculotemporal nerve, a branch of the mandibular nerve (cranial nerve V3), with contributions from the auricular branch of the vagus nerve (cranial nerve X), the facial nerve (cranial nerve VII), and possibly the glossopharyngeal nerve (cranial nerve IX). The inner surface of the tympanic membrane is innervated by the glossopharyngeal nerve. When the eardrum is illuminated during a medical examination, a cone of light radiates from the tip of the malleus to the periphery in the anteroinferior quadrant. Unintentional perforation (rupture) has been described in blast injuries and air travel, typically in patients experiencing upper respiratory congestion that prevents equalization of pressure in the middle ear. It is also known to occur in swimming, diving (including scuba diving), and martial arts. Patients suffering from tympanic membrane rupture may experience bleeding, tinnitus, hearing loss, or disequilibrium (vertigo). However, they rarely require medical intervention, as 80 and 95 percent of ruptures recover completely within two to four weeks. The prognosis becomes more guarded as the force of injury increases. The pressure of fluid in an infected middle ear onto the eardrum may cause it to rupture. Usually this consists of a small hole (perforation), which allows fluid to drain out. If this does not occur naturally, a myringotomy (tympanotomy, tympanostomy) can be performed. A myringotomy is a surgical procedure in which a tiny incision is created in the eardrum to relieve pressure caused by excessive buildup of fluid, or to drain pus from the middle ear. The fluid or pus comes from a middle ear infection (otitis media), which is a common problem in children. A tympanostomy tube is inserted into the eardrum to keep the middle ear aerated for a prolonged time and to prevent reaccumulation of fluid. Without the insertion of a tube, the incision usually heals spontaneously in two to three weeks. Depending on the type, the tube is either naturally extruded in 6 to 12 months or removed during a minor procedure. Those requiring myringotomy usually have an obstructed or dysfunctional eustachian tube that is unable to perform drainage or ventilation in its usual fashion. Before the invention of antibiotics, myringotomy without tube placement was also used as a major treatment of severe acute otitis media. In some cases the pressure of fluid in an infected middle ear is great enough to cause the eardrum to rupture naturally. Usually this consists of a small hole (perforation), from which fluid can drain. The Bajau people of the Pacific intentionally rupture their eardrums at an early age to facilitate diving and hunting at sea. Many older Bajau therefore have difficulties hearing. Wikimedia Commons has media related to Eardrum. This is a normal left eardrum. ^ Purves, D; Augustine, G; Fitzpatrick, D; Hall, W; LaMantia, A; White, L; et al., eds. (2012). Neuroscience. Sunderland: Sinauer. ISBN 9780878936953. ^ Marchioni D, Molteni G, Presutti L (February 2011). "Endoscopic Anatomy of the Middle Ear". Indian J Otolaryngol Head Neck Surg. 63 (2): 101–13. doi:10.1007/s12070-011-0159-0. PMC 3102170. PMID 22468244. ^ Ritenour AE, Wickley A, Retinue JS, Kriete BR, Blackbourne LH, Holcomb JB, Wade CE (February 2008). "Tympanic membrane perforation and hearing loss from blast overpressure in Operation Enduring Freedom and Operation Iraqi Freedom wounded". J Trauma. 64 (2 Suppl): S174–8. doi:10.1097/ta.0b013e318160773e. ^ Mirza S, Richardson H (May 2005). "Otic barotrauma from air travel". J Laryngol Otol. 119 (5): 366–70. doi:10.1258/0022215053945723. PMID 15949100. ^ Green SM; Rothrock SG; Green EA= (October 1993). "Tympanometric evaluation of middle ear barotrauma during recreational scuba diving". Int J Sports Med. 14 (7): 411–5. doi:10.1055/s-2007-1021201. PMID 8244609. ^ Fields JD, McKeag DB, Turner JL (February 2008). "Traumatic tympanic membrane rupture in a mixed martial arts competition". Current Sports Med Rep. 7 (1): 10–11. doi:10.1097/01.CSMR.0000308672.53182.3b. PMID 18296937. ^ Kristensen S (December 1992). "Spontaneous healing of traumatic tympanic membrane perforations in man: a century of experience". J Laryngol Otol. 106 (12): 1037–50. doi:10.1017/s0022215100121723. PMID 1487657. ^ Lindeman P, Edström S, Granström G, Jacobsson S, von Sydow C, Westin T, Aberg B (December 1987). "Acute traumatic tympanic membrane perforations. Cover or observe?". Arch Otolaryngol Head Neck Surg. 113 (12): 1285–7. doi:10.1001/archotol.1987.01860120031002. PMID 3675893. ^ a b Garth RJ (July 1995). "Blast injury of the ear: an overview and guide to management". Injury. 26 (6): 363–6. doi:10.1016/0020-1383(95)00042-8. ^ a b Smith N, Greinwald JR (2011). "To tube or not to tube: indications for myringotomy with tube placement". Current Opinion in Otolaryngology & Head and Neck Surgery. 19 (5): 363–366. doi:10.1097/MOO.0b013e3283499fa8. PMID 21804383. ^ Langenheim, Johnny (18 September 2010). "The last of the sea nomads". The Guardian. Retrieved 15 February 2016.